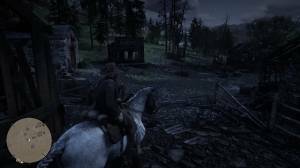 The burned down ruins of this town is found a short distance to the southwest of Horseshoe Overlook, where your gang camped in Chapter 2. In the Sheriff’s Office, there’s a lockbox under the table near the table. If you open it, there’s a Special Horse Stimulant Pamphlet and a gold bar. Before picking it up, be aware that there’s a known exploit that will allow you to pick up multiple gold bars from the same lockbox, which will make you exceptionally rich very early in the game. We don’t have the video of the actual exploit but you’ll be able to find a lot of videos of the trick in YouTube. Doing this exploit can either improve or ruin the experience for you so do this only at your own discretion. 2. Open the lock box in the Sheriff’s Office. DO NOT PICK UP THE PAMPHLET. 3. 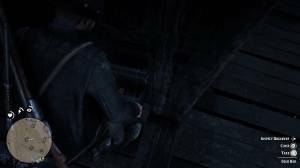 Pick up the gold bar and while Arthur is in the middle of the pick up animation (when he bends to pick up the gold bar), pres Options and save your game. 4. Load the game with your latest save. 5. 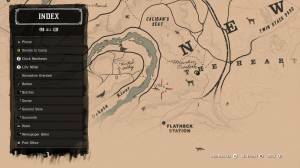 Head back to the lockbox and you should be able to pick up more gold bars.